It's no secret that I was a big fan of Tomb Raider (2013). As my friend Sam and I explored in our Interactive Friction season on that game, it wasn't perfect, but it served as an excellent branching point to build a whole franchise off of. When the credits rolled, both of us were excited to see what direction Crystal Dynamics would go in future games. But now, after playing through the following two games, Rise of the Tomb Raider and Shadow of the Tomb Raider, I'm left feeling snubbed. It's less certain now that there is a clear direction for the series. 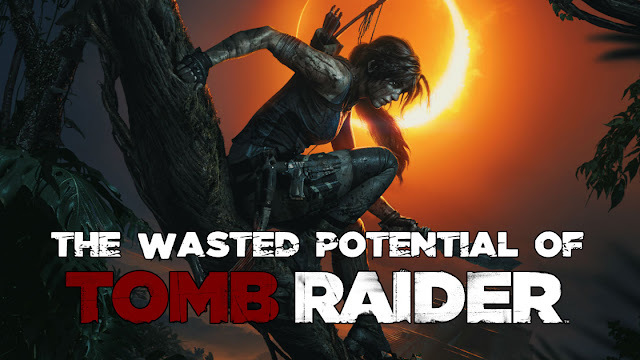 Bluntly, both games are emblematic of a wasted opportunity to really explore Lara's character and expand on it, repeating too much of the 2013 reboot's story and systems in contexts that don't make sense. Lara Croft from Tomb Raider (2013) is a fresh-faced archaeology student thrust into a perilous survival situation. Separated from the rest of the expedition, she braves the elements of the island she's crashed into, discovering her own capabilities. This is expressed mechanically in the game's experience system. As she hunts animals, completes story beats, explores tombs, or defeats enemies, she gains points which she can spend to learn new skills that help her in her journey. Where she starts off on unstable ground, with no real training or knowledge in how to fend for herself, by the end of the game she has grown into a capable hunter and fighter. In building up XP and upgrading her gameplay capabilities, the player takes that journey with her. They feel the difference when heavily armored enemies that were once intimidating can now be killed from stealth in a single blow, or while shotgun-blasting foes in direct combat. When the story starts building up Lara's confidence and determination, that bleeds into all other aspects of the game. This culminates in the final scene where a young Lara Croft defeats the forces threatening her and the remains of her team by taking up her signature dual-pistols, ascending to become the legendary Tomb Raider her previous incarnation was known as. And yet, despite laying the groundwork and setting her up to become a daring adventurer, the sequels blunt this character arc to uncomfortably preserve the status quo. While it's true that Lara becomes a more proactive character in Rise and Shadow, the game never escapes the tone of the original. She still feels like a victim, constantly having to reinforce her self-worth and determination with chants of “I can do this” in a tone that implies she's not sure if she believes herself. Meanwhile, she's gunning down large numbers of mercenaries, either through stealth or in firefights. The series seems torn about whether she is a trauma victim barely holding on or a mass murderer who has no issues with taking out whole military bases' worth of personnel. This is undercut by the fact that she's taking initiative in both stories of her own free will. It's hard to feel sympathy for her when she's talking about how difficult her struggle is when she can literally just leave at any point and wash her hands of the whole story. This push and pull between Lara-the-trauma-victim and Lara-who-smiles-at-death is felt mechanically as well. The skills and arsenal built up over the course of the 2013 reboot, including the dual-pistols iconic to the character of Lara Croft (which are never seen again past that point), are gone at the start of the game, except for some choice implements. Both her and the player are almost back down to square one. Where Tomb Raider (2013) used the leveling system and new gear in order to show her development, the sequels seemed to keep with the structure for no other reason than obligation, with the idea that Lara can't be an explorer, excited by the thrill of adventure. She must simultaneously be scared and helpless enough that the audience feels they need to protect her, but independent and assertive enough for us to believe that she wouldn’t just back down after realizing she’s in way over her head. For all of the things Rise and Shadow kept without consideration, they were quick to abandon most of the cast. The reboot goes out of its way to establish a whole host of background characters in the expedition team that work with Lara at various points in the story. They all run the gambit of established tropes, from the grizzled mentor figure that helps her grow into the person she needs to be to stay alive, the kidnapped best friend, the nerdy tech guy, et cetera, but they all serve as Lara's support as she begins to take a leadership role. Quite a few of them perish throughout the story (in fact, over half of them do), but the ones that survive are shown to have an implicit trust in the young Croft heiress. By following her lead, they are able to both save their captured teammate and escape the island they crashed on. In fiction, it's common for a lead character to be backed up and supported by a number of side characters that form their core support structure. No matter how great the obstacle is, some combination of people in this group will have the skills/expertise to overcome. When I saw this cast of characters in Tomb Raider (2013), billed as a new origin story for Lara Croft, I naturally assumed the survivors stranded on the island with her were going to grow into her “Scooby Gang”. In previous Tomb Raider games, Lara always had help to get through her adventures on the other end of a radio, so I naturally assumed they would do the same for this new version of the character, using the cast of this first reboot game to front load and establish character relations. But this never happened. In both Rise and Shadow, the only returning member of the cast is Jonah, a person whose character was so underdeveloped in the 2013 reboot that I would have had difficulty remembering otherwise. (This is especially curious since Sam, the woman Lara spends much of that game trying to rescue, is supposedly her best friend who goes everywhere with her as a videographer.) Sure, he does offer support as one might expect, but he's only one character. Ideally, there would be multiple people for Lara to play off of, work with, and learn about. It's such a missed opportunity to not take advantage of all the relationships developed in first reboot game and build upon them in the sequels. While Shadow of the Tomb Raider is the catalyst for this piece, many of these thoughts and feelings have been stewing in my heart since I played Rise of the Tomb Raider a few years back. It's extraordinarily frustrating to see this character misused in this way, and that is only one avenue of criticism. Other people, like Dia Lacina at Waypoint, have approached this game and series from their own angles. I walk away from this “origin story trilogy” disappointed, finishing it mostly out of obligation. Were Tomb Raider to continue, I honestly don't know whether or not I would actually care.